On April 17, 1975, the Khmer Rouge regime took power in Cambodia. 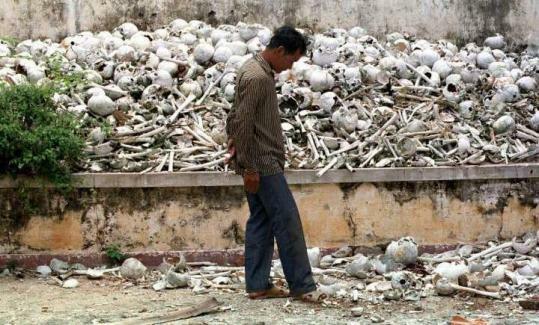 Genocide followed, with an estimated 2 million Cambodians, about 30 percent of the population, disappearing in the “killing fields.’’ There was widespread destruction of cities and homes, forcing people into labor camps in the countryside. Intellectuals, artists, and performers, as well as people associated with the former government, were targeted. The Khmer Rouge abolished money, closed hospitals and libraries, and banned religious practice. People were tortured, starved, killed, and worked to death. After Vietnam invaded Cambodia in late 1978, the Khmer Rouge was forced into the jungles, and approximately 600,000 Cambodians fled to the country’s border. During 1979, refugee camps were opened by the United Nations along the Cambodian-Thai border, housing about 160,000 refugees. Another 350,000 lived in Thailand. An additional 100,000 Cambodians fled to Vietnam, where they also received assistance from the UN. Transit number photos were taken in refugee camps and holding centers upon approval for immigration to a third country. Out of the 600,000 refugees, approximately 150,000 were admitted to the United States between 1979 and 1985. Other refugees went to Canada, France, Australia, and a few other countries. When the UN closed the camps in 1999, at least another 200,000 refugees living on the border were forced to return to Cambodia. There are about 206,000 people of Cambodian descent living in the US. Lowell has an estimated 30,000 to 35,000, making it the second largest Cambodian community in the US after Long Beach, Calif., which has an estimated 60,000.